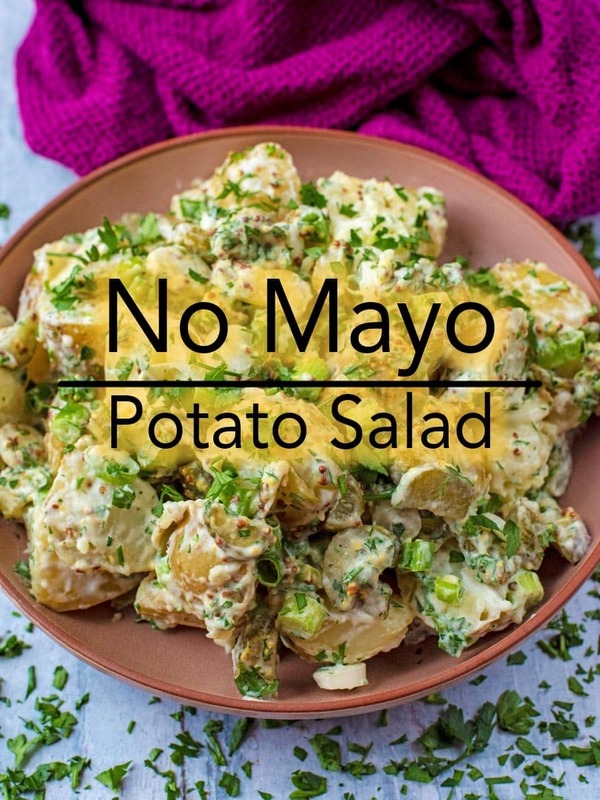 No Mayo Potato Salad by Hungry Healthy Happy - less than 150 calories! 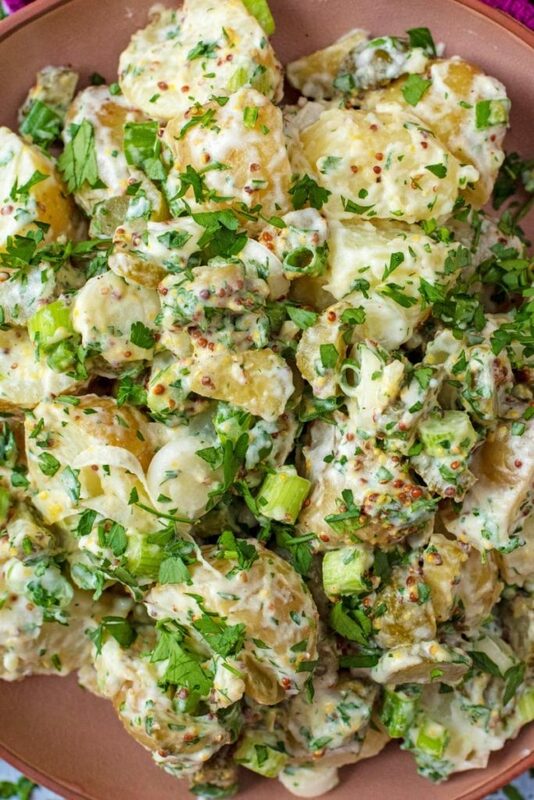 The average portion of potato salad has over 400 calories in it! Our lighter No Mayo Potato Salad uses Greek yoghurt instead of mayonnaise, and is less than 150 calories per portion. 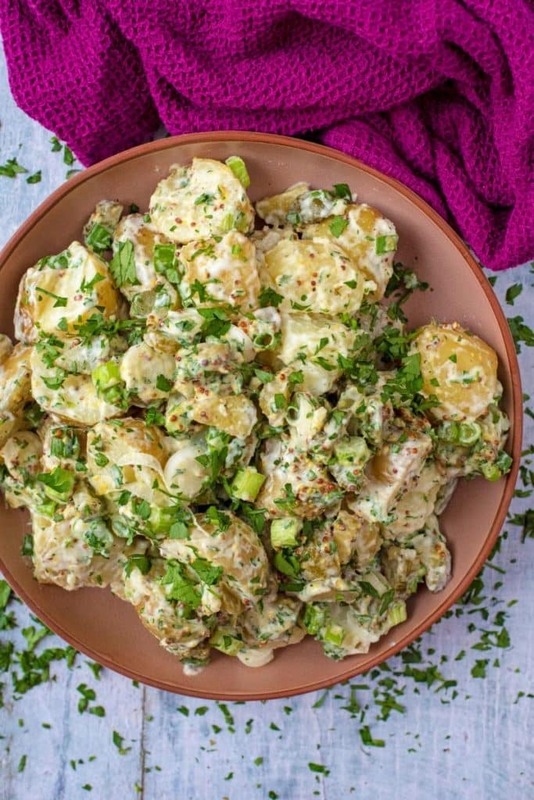 If you want all of the flavour and creaminess from a potato salad, but less of the calories and fat, then give this healthy potato salad a try at your next BBQ! 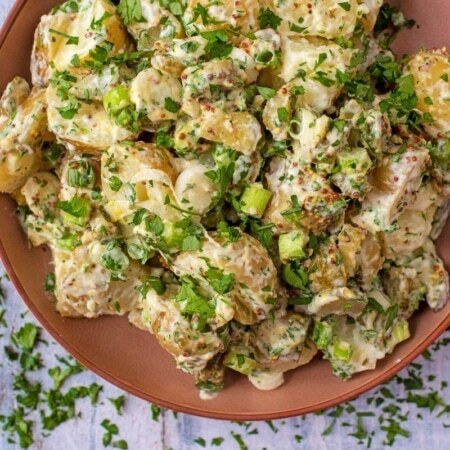 Potato salad is a must at every BBQ, but along with all the other side dishes, burgers and skewers the calories can quickly add up. We try to make lighter changes wherever we can, but still keep all the flavour. Mayo gives potato salad lots of creaminess, but you can replicate that by using Greek yoghurt, but saving lots of calories and making it lower in fat. Using Greek yoghurt makes the potato salad a little bit tart, which is why we have added chunks of gherkins to ours as the vinegar overpowers that tartness. Don’t like gherkins? (shocked face), then just add a splash of cider vinegar instead. 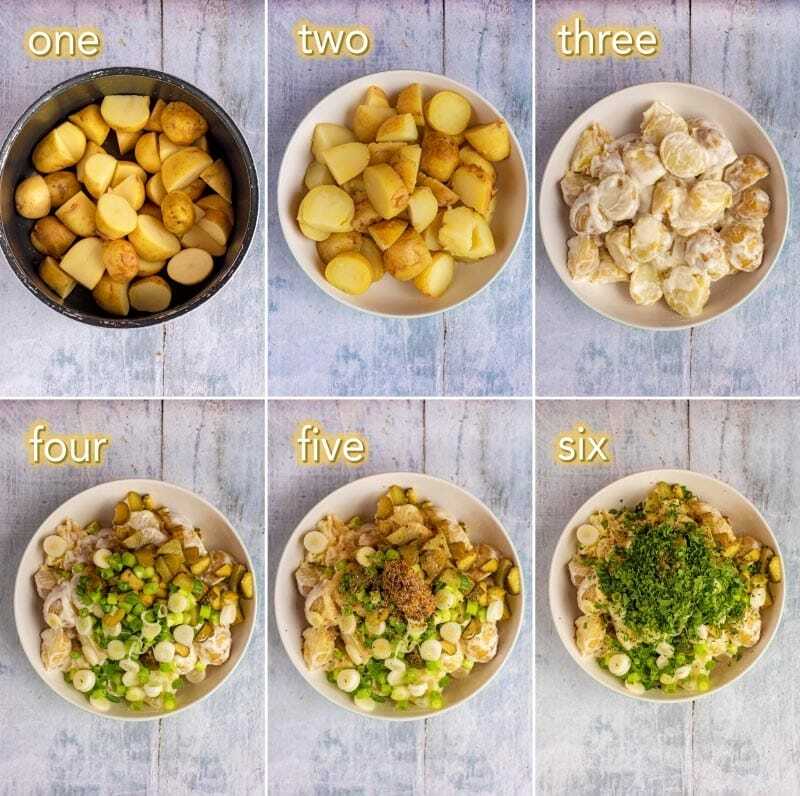 Potato salad isn’t traditionally the healthiest side dish (over 400 calories), but there are lots of ways you can make it healthier. As well as using Greek yoghurt instead of mayo, we have added lots of fresh herbs to give plenty of flavour without all the extra calories. The spring onions (scallions) and gherkins (pickles) have a really strong flavour and the wholegrain mustard really brings the whole dish together – but it can easily be left out. What potatoes to use for a potato salad? There are hundreds of varieties of potatoes out there, it can be hard to know which ones to use in a potato salad. The main thing to go for is waxy over starchy as they hold their shape well when boiled. We always use new potatoes, like Jersey or Cornish, for this reason. Go for potatoes that are all around the same size as they will cook evenly. Potato salads are a healthier choice than pasta salads usually, as they are pretty much all vegetable. They are also a good source of potassium and fibre (keep the skins on). This potato salad without mayo is a great opportunity to sneak in some extra vegetables too. Throw some shredded spinach in, sweetcorn or chunks of bell pepper. Can I Use Anything Apart from Greek Yoghurt? Greek yoghurt is pretty much the main healthy swap in this recipe. However, if you don’t like the tart flavour that yoghurt gives, you could use a reduced fat creme fraiche or sour cream instead. Or, skip the creamy dressing and go an oil and vinegar route instead. Mix some olive oil, red wine vinegar, mustard and herbs together for a simple dressing. I have served this potato salad without mayo at pretty much every BBQ we have had an no-one has even guessed that it had Greek yoghurt in it. So, surprise everybody! 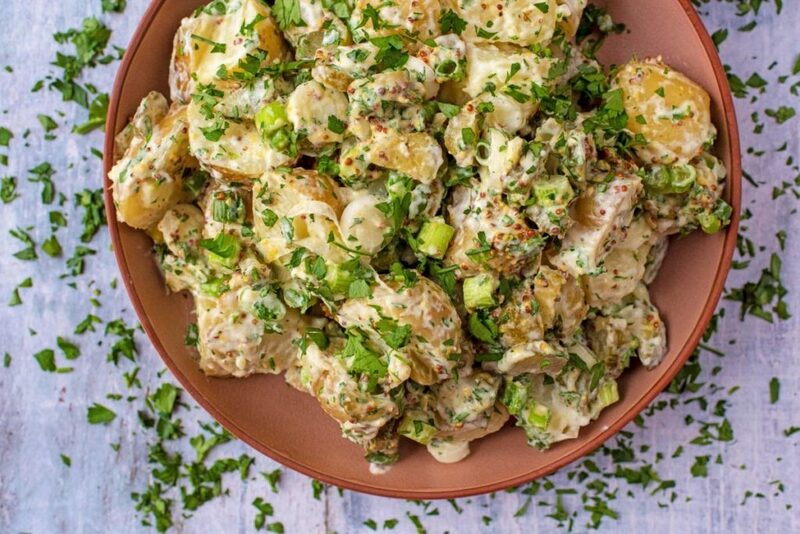 There are so many other flavours going on in this healthy potato salad, and still all the creaminess, that nobody feels like they are missing out. One: Add the potatoes to a pan of boiling water and simmer until they are just tender, around 10 minutes. Two: Drain them and rinse them and put them in a large bowl. Three: Add the yoghurt to the potatoes and mix well. Four: Put the gherkins and spring onions on top of the potatoes. Five: Then add the salt, pepper, garlic powder and mustard. Six: Add the fresh parsley. Seven: Mix well and serve (not shown below). If you don’t like gherkins, then take them out and use a splash of apple cider vinegar instead. Add some extra vegetables like sweetcorn, shredded spinach or chopped up bell pepper for a nutritional boost. If you still want to use mayo, why not try using half mayo and half Greek yoghurt instead – it will still save you some calories and fat. Use waxy potatoes rather than starchy ones, as they will hold their shape better. 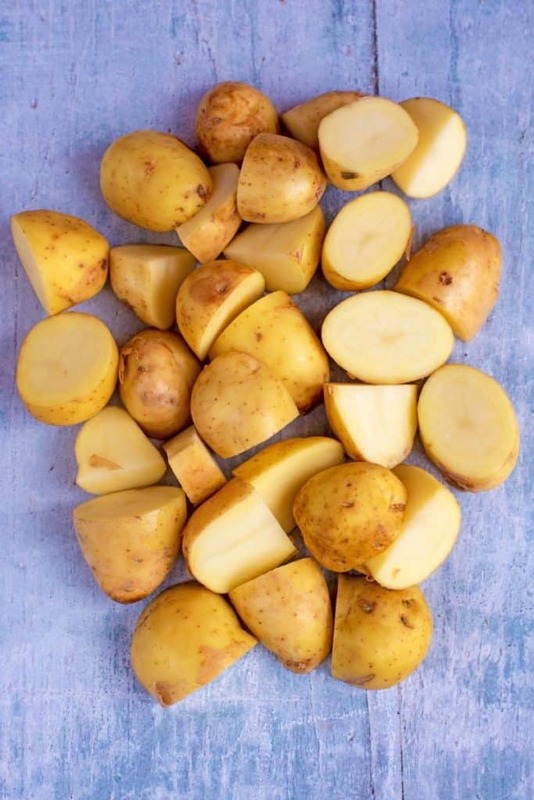 We use Jersey Royals or Cornish new potatoes. You could swap out the parsley and use chives, tarragon or dill instead. Swap the spring onions for some finely chopped shallots to mix it up a bit. Love spice? A tbsp of chipotle paste goes a long way in this dish and gives it a Mexican twist. Do you want to be kept up to date on more delicious posts like this No Mayo Potato Salad? Please subscribe to the blog mailing list (it takes 30 seconds). If you’ve tried this No Mayo Potato Salad or any other recipe on the blog then let us know how you got on in the comments below, we love hearing from you! You can also FOLLOW US on FACEBOOK, TWITTER, INSTAGRAM and PINTEREST to see more delicious recipe ideas, behind the scenes shots and also what we are getting up to. Our lighter No Mayo Potato Salad uses Greek yoghurt instead of mayonnaise, and is less than 150 calories per portion. Add the potatoes to a pan of boiling water and simmer until they are just tender, around 10 minutes. Drain them and rinse them and put them in a large bowl. Add the yoghurt to the potatoes and mix well. Put the gherkins and spring onions on top of the potatoes. Then add the salt, pepper, garlic powder and mustard. If you don't like gherkins, then take them out and use a splash of apple cider vinegar instead. If you still want to use mayo, why not try using half mayo and half Greek yoghurt instead - it will still save you some calories and fat. Loved that you used Greek yogurt instead of mayo! This is a great summer side! So glad to have this lighter version. yes please! i love this lightened up version! potato salad is so, so good, but sometimes I just want it a little healthier than the usual potato salad! Now that is a super colorful potato salad! I love that you make it healthier with the yogurt! It’s my favorite, but I don’t make it very often, because it has so many calories! Potato Salad is a classic dish that everyone needs to have in their repertoire. Your mayo-free recipe has all my favourite flavours, and yes! I love gherkins! Thanks for sharing. Pinning!